Finding Animal Rescue and Shelter partners is easy with Doobert’s powerful matching technology! Doobert is like a dating service for Animal Welfare organizations. 2. Under FIND / ADD, select FIND NEW PARTNERS and start a new search. Refine what you’re looking for to get the best match. 3. Find the partners that match what you need and contact them to start working together. You can then add them to your favorites and quickly see new animals that they have available to transfer. 4. 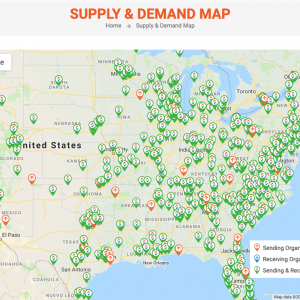 Use our Supply / Demand map to visually see nearby organizations and whether they are source or destination organizations.